Black Mass is a vastly underwhelming dramatization of notorious criminal Whitey Bulger's reign over South Boston through his Winter Hill Gang and an uneasy alliance with the FBI as a protected informant during the 1970-80s. Actor turned director Scott Cooper has constructed a film that unfortunately feels so slight and procedurally limp despite a cast of American and non-American all-stars putting on their best Boston accents of varying quality. A game Johnny Depp is viciously stoic in his restrained yet charismatic portrayal of Bulger under all that makeup. His monstrous nature is layered with a thick layer of charm and appeal. However, it's really Joel Edgerton, full of swagger, as corrupt FBI agent John Connolly who anchors the film with his unexplained, boyish admiration of Whitey and his politician brother, Billy, played almost too straightforwardly by Benedict Cumberbatch. The parallel real-life cop/criminal elements and moral complexities were partially mined in The Departed but Cooper, while obviously no Scorsese, can't decide on a singular cinematic vision on how to conceptualize such evil and morally complex characters. Black Mass starts promising enough with after the fact interviews to put Bulger into a narrative context exploring his criminal relationships. However, this conceit and using his underlings to build his character is abandoned halfway through the film in favour of more conventional scenes highlighting the major points of his criminal life. The deep cast of all-stars are largely wasted in small, largely cut down roles. We never get much sense or characterization from the likes of Dakota Johnson (doing her best as the mother to Bulger's son), Julianne Nicholson (a noteworthy turn as Connolly's wife), Peter Sarsgaard, Juno Temple, Corey Stoll, or FBI agents played by Kevin Bacon, David Harbour, and Adam Scott. Jesse Plemons and Rory Cochrane are fairly appealing as Bulger's righthand men but are largely forgotten after having dynamic arcs set up for them without any payoff. Cooper never gives us much of any reason why these real-life characters do what they do. The acting and performances scene to scene are fine but there's no momentum or overall arc due to Cooper's more workmanlike direction. It's also not entirely clear in the film the overall impact Bulger played on Boston as a whole through his reign of terror, introducing/trafficking drugs into the community, how he made or led his criminal empire, and his notorious public persona. 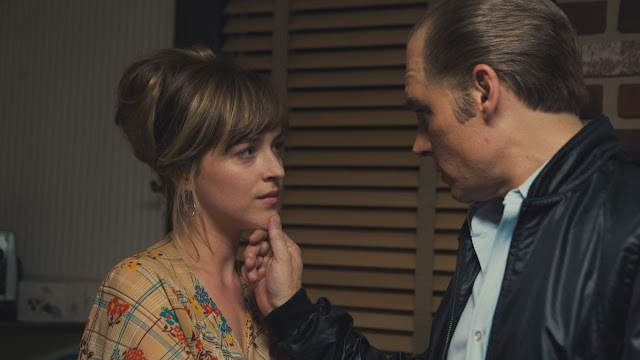 Black Mass never truly takes advantage of its inherently compelling real-life material.